Over the last year, I have attended quite a few social media conferences, and I have been alarmed that many presenters seem not to have updated their talking points, examples and messaging since Facebook had 500 million active users. (July 2010, to be specific.) Perhaps they are worried about speaking over audiences' heads, or maybe it is time for some social media speakers to update their shtick. Either way, I feel many of the conference presenters I have seen in the past twelve months could have done much more to enhance their reputation and educate the audience. At one time while speaking to an audience, I intoned, "Twitter is like a cocktail party." That was in 2009, so I can be forgiven, but we can now declare a moratorium on any metaphor that declares a social network to be a cocktail party, golf course, bar, coffee shop, scrapbook, "like dating," or akin to anything other than a powerful business tool. People who attend social media conferences (not to mention most of the developed world) have adopted these platforms and thus no longer need to have social networking simplified with glib analogies. Simple metaphors were fine when no one understood microblogging or status updates, but using this sort of shorthand today misleads audiences and diminishes the complexity and importance of social networks. Twitter and Facebook are not like a cocktail party--they are powerful enterprise platforms for communication, customer service, reputation management, sales, collaboration and marketing. Not only are the rudimentary analogies unnecessary in 2013, they can even be counterproductive. As social continues to struggle for attention and budget within companies, the last thing senior executives need to hear is that one of their enterprise social platforms is a "cocktail party." Your peers in other departments don't reduce their procurement, sales and accounting processes to ridiculously basic analogies ("tax accounting is like playing marbles"?!? ), and it is time social media speakers stick to business language when defining and explaining social networks to audiences. United Breaks Guitars goes viral! Dell Outlet sells $2 million of merchandise on Twitter! A YouTube video of a Comcast technician asleep in a customer's home gets millions of views! These are just a few of the well-known (and too-often repeated) social media examples that can be retired. By now, everyone employed in social media does (or should) know these case studies. These tired examples, all from the early days of social media, have collected cobwebs. If you are a presenter, the time has come to find case studies that haven't already appeared in thousands of presentation decks and blog posts. They are not hard to find--even a minimal bit of monitoring of Mashable Social, Social Media Explorer, Social Media Examiner, Social Media Today or dozens of other blogs and news sites can furnish a flow a recent examples. Want to get an audience to look up from their tablets and smartphones and pay attention? "Here's a case study you may not have heard of" works every time. I offer one important caveat to this suggestion: Feel free to cite an old, tired example if you intend to violate expectations and help people to see it in a new light. For example, I still cite United Breaks Guitars, not because it is an example of a "social media crisis" but because, despite what everyone "knows" about the situation, it did not hurt the airline's business. In the six months following the release of the "United Breaks Guitars" video, the company's stock outperformed competitors by more than 150%. I find most people assume United's bottom line took a hit, so they are surprised to hear "the rest of the story." That is one example of how to turn an old case study into something new for a social media presentation. For some reason, speakers at several social media conferences I have attended recently felt it necessary to take the audience's time to explain basic mechanics of social networks. Last week, speakers from Twitter spent 30 minutes on stage to--I kid you not!--explain retweets, hashtags and replies to social media professionals attending a social media conference. This makes as much as sense as telling an audience at an email marketing event what the "reply all" button does. Does every attendee at a social media conference understand the basics? No, some are still new to the space and need education, but that doesn't mean speakers at social media events should furnish those lessons. Conference speakers are under no obligation to bore 90% of the audience in order to make sure the remaining 10% are not left behind; in fact, they diminish their attention and reputation by doing so. It is 2013, and by focusing on Social Media 101 lessons rather than advanced social strategies, conference speakers not only insult many in the audience, they also miss an opportunity to raise their reputation, expand listeners' knowledge and leave attendees with new ideas and inspiration. Social media has become social business, and that means the case studies shared at conferences should furnish business results, not merely social media outcomes. Too often, case studies presented at social media events end with a slide listing new fans, new followers or number of engagements as the payoff. By now, social media professionals realize that these are not an end but the means to end--so share the end! I am not suggesting every social media case study must have a financial ROI as an outcome, but it is not too much to ask that those bragging about success at social media conferences tell us how the business (and not just the fan page) was improved. Don't tell us that you generated new fans (that failed to increase attention or enhance business); instead, tell us how your social media efforts saved money, increased inbound traffic, enhanced awareness, generated new ideas, improved Net Promoter Score, solved customer problems, improved retention or generated new customers. A good business case study needs a business outcome, and I continue to see far too many case studies presented at social media events that fail to tell an entire and compelling story. Citing the source of data in your decks not only adds credibility to your presentation, it also furnishes a way for those in the audience to seek out more information and validate the data. In addition, citing the source is the fair thing to do; if a study or survey is interesting enough for you to share in your deck, then you owe credit to those who invested in and conducted the research. If some habits of social media presenters annoy me, this one amazes me--I have seen people on stage admit to violating FTC disclosure guidelines with either no awareness or no shame. Some speakers share programs that involve the distribution of free merchandise or social sweepstakes, but the tweets and posts they include in their decks are devoid of any required disclosure. In addition, I have heard influencers admit on stage that they hype clients' products without acknowledging the material relationship. Of course, if the FTC is going to sleep on the job and if consumers show little concern that earned media is not, in fact, earned, there is little risk in these sorts of non-compliant programs. Still, I would hope that speakers at social media conferences might strive for greater ethics in the industry and at least nod to the well-established FTC disclosure guidelines. So, what say you? Do these presentation habits annoy you? Think I am wrong on any of these? Am I missing something from my list? Please share your thoughts, and perhaps we can help make each other better speakers and presenters. Today, I presented at the LIMRA/LOMA conference, and I wanted to share my deck. Financial Service companies are facing a trust crisis. The industry should be built on trust--people entrust us with their financial future and people pay insurance premiums for years or decades without seeing the benefit--and yet firms in financial service and banking are starving for trust. The Edelman Trust Barometer finds that financial services are the least trusted industry among those measured, and the Certified Financial Planner Board discovered most people--most!--agree that "it's hard for me to know who to trust for financial advice." Billions of dollars spent every year on marketing, advertising and PR in the financial service industry, and most people do not know who to trust? That isn't a data point--it's an indictment. Person to person: Trust exists today person-to-person, and some firms are tapping this source of trust. Ameriprise allows site visitors to use LinkedIn to find advisors within their trusted network, and Fidelity is using private communities to facilitate and participate in trusted peer-to-peer conversations. With transparency: Customers demand greater transparency from brands, and Vanguard is doing a good job of increasing transparency by making their executives--even the CEO--available for social media Q&As on Facebook and Twitter. With quality interactions: Some companies are creating higher-quality interactions that increase trusted relationships. Prudential has partnered with PeopleLinx to create more connections and interactions between licensed professionals and key customers, resulting in new business opportunities. And USAA brings the same responsiveness it demonstrates in other channels to social media, further increasing the trust and advocacy USAA earns from customers. With co-creation: Consumers are 98% very likely or likely to buy a product they helped ideate. Barclaycard tapped its community to help build a credit card from the ground up, resulting in higher retention and lower complaints compared to other credit card launches. I hope you enjoy the deck. As always, your feedback is very welcome! Jeff Bezos isn't alone in buying a newspaper--fellow billionaire Warren Buffett has been on a newspaper buying spree himself, acquiring 28 daily newspapers in the past two years. Buffett's strategy has been to go local. In his words, "Wherever there is a pervasive sense of community, a paper that serves the special informational needs of that community will remain indispensable to a significant portion of its residents." So, although he expects "Berkshire’s cash earnings from its papers will almost certainly trend downward over time," Buffett also predicts, "these papers will meet or exceed our economic test for acquisitions." A better user experience: Bezos has often said that his key to success was not simply knowing technology but focusing on the user experience. With Kindle and The Post, he has an opportunity to reframe what it means to read, consume, share and participate in the news. A strong voice for the reader: Amazon was an early leader in giving consumers' the chance to rate products and each other, something we all take for granted today. There is no place where online news can more improve--and no better way to make news sites "sticky"--than to improve the commenting functionality. Today, most news sites are vast wastelands of trolls and partisan flamers; a new approach could draw more reasonable readers into the dialog and connect them more strongly both to the news and news provider. Not a news site; a news platform: Amazon is no longer simply a site that sells stuff; it is now a powerful cloud platform used by other companies. A recent Forrester survey found that Amazon Web services is the most common choice for enterprise cloud development among software developers, and Amazon recently announced that "other revenue"--which largely consists of Amazon Web Services--was up 59% from a year ago. How could Bezos spark not just innovation for The Post but create a platform that could be sold to (and help) other news organizations? Local classifieds make a return? Almost two decades ago, eBay, Craigslist and (to a lesser extent) Amazon put newspapers out of the classifieds business. Newspaper classified ad revenue--once a vital source of revenue for newspapers--is down 75% in the past twelve years. Could Amazon bring peer-to-peer business back to news organizations? With the growth of the sharing economy, it seems a terrific time for the local newspaper to attempt to reassert itself in the neighbor-to-neighbor commerce business by bringing to market new, innovative P2P offerings. Bezos and Buffett are entering a troubled business. As noted in the infographic below, the newspaper industry has seen declines in everything from circulation to ad revenue to consumer trust. But there are brighter signs, as well, with circulation revenue stabilizing and online newspaper visitors, reach and time trending upwards (ever so slightly). It will be interesting to see what newspapers do differently under the leadership of Bezos and Buffet. Both have a knack for making the right financial decisions, although they are also known for taking a longer view on ROI than is typical in business today. Don't expect any changes overnight, but watch for the newspaper industry to get more innovative and even more digital in the years to come. Normally on this blog, I speak to marketing and communication professionals, but this post is for everyone. We all think we know how to use Facebook, but despite improvements in usability, there are still some things that can trip up even the most experienced Facebooker. Many of us are missing communications, unnecessarily permitting access to our data and potentially sharing our status updates more widely than intended. Below are a series of quick tasks you should perform once a month to ensure you maintain maximum control over your Facebook communications, data and posts. In fact, here's your first task: Copy and paste this information into a 15-minute calendar appointment that repeats each month. This little bit of effort may prevent regret, frustration and problems later. Once a month, I see a post on Facebook along the lines of, "OMG, did you know Facebook has an Other Inbox?! I've been missing messages sent to me!" Yes, Facebook furnishes you with two "in" folders. One is the primary inbox that you know and probably use all the time when you receive and send private messages to and from friends. The second is an "Other Inbox," and it is designed to prevent you from getting spam and other unwanted messages from people you do not know. While most of the communications that end up in the Other Inbox are probably not that important to you, sometimes you might miss a note from an old friend, peer, prospective employer or other people with whom you are not currently connected on Facebook. Once a month, check that Other Inbox. You will find a link to your Other InBox on your Messages page, accessed by clicking "Messages" in the left navigational column on the home page. You can also click the tiny message icon at the top of your screen, and you will find an easy-to-overlook link to the Other Inbox in the messages drop-down menu. We all do it--as we surf the web or use Facebook, a site or app asks for our Facebook permission and we grant it. But do we know who is behind the app and what they might do with the data they access? Granting permission is something we probably all do with insufficient consideration for the potential ramifications. More importantly for our monthly Facebook hygiene review, are we still using the applications that are collecting our data? If you are not using an application, there is no reason for it to continue accessing your posts, personal data and friend information. Click the "App Center" in the navigation column on the left side of the home page. Then select "Your Apps" on the left side of the App Center. Review the apps that have access to your data. You can sort them by the "last used" date, which is handy for finding applications you haven't used for months or years (and can probably dump). This app can also: This section contains even more permissions you may have granted, such as whether the application can post as you, can access messages in your inbox, can checkin on your behalf and can see your friend requests. Last data access: Facebook permits you to see the last time the application collected your data and what data the app accessed over the last 90 days. Remove or Report: Finally, for each application you can remove the application so that it cannot access your data or you can report it if you feel the application is abusing or violating your privacy. People have lost their jobs because of status updates on Facebook. More than a third of divorce filings mention the word Facebook. And some individuals have been arrested for Facebook posts. I am certainly not suggesting you post stupid, criminal or unethical things on Facebook, but it is always helpful to control who can see your posts and other Facebook information to minimize potential problems. 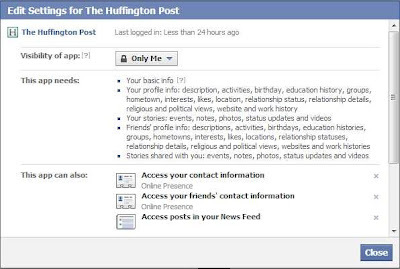 Verify your default setting: If it is set for Public, anyone can see your Facebook posts (provided you do not change the setting for specific posts). Other default options include Friends and Friends except Acquaintances, which permit much tighter control to your information. 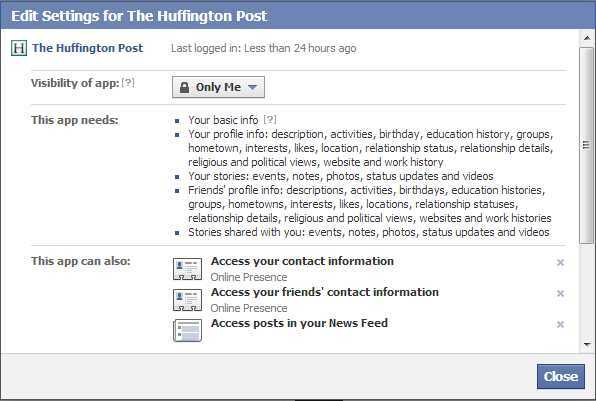 (You can make any friend an "Acquaintance," and their posts will rarely show up in your news feed, plus you can exclude them from seeing your status updates by using the "Friends except Acquaintances" option.) You can even chose to permit access to "Only Me" (perfect for introverts) and to Custom audiences based on lists and even individuals. Check your Activity Log: As you post, others tag you and applications share your activity, this data is captured in an Activity Log. You should have seen (or made) all of the updates found in this list, but sometimes you may miss that you have been tagged in a photo, checked in by a friend to a location or had an application post on your behalf. The Activity Log allows you to review, delete and edit posts to which you are connected. For example, click Photos and then "Photos of You" to see pictures in which you have been tagged. The "All Apps" link permits you to see the data being shared on your behalf by applications; for example, if you do not want Spotify sharing every song you hear, you can click the pencil icon to stop all posting from Spotify or remove the application from your Facebook profile. What do other people see on my timeline? Finally, look at yourself as others see you; no, not in a bathroom mirror, but using Facebook's mirror. By selecting "View As" you can see your profile as others can see it. By default, this view is set for "Public." Take a moment to assess this view of your Facebook activity, because "Public" means public--anyone on the internet, whether they are a friend or even a Facebook user, can see your information in this manner. How does it look? Would you want your boss to see this? A prospective employer? A stranger? If you have concerns, you can change your default posting setting, alter other privacy settings, adjust your Facebook habits or make use of the "Post Privacy Setting," which permits you to change who can see each individual Status Update you make. Facebook is the greatest communication tool in human history. It also may be the easiest way ever invented to cause personal and professional problems. 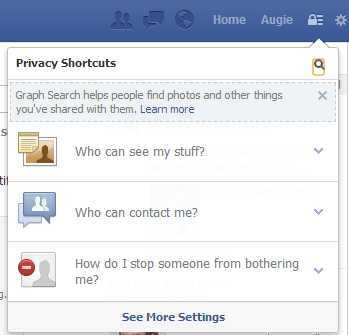 By reviewing your Other Inbox, Facebook application settings and "Who Can See My Stuff" information, you can better control your Facebook data and minimize the potential for inadvertent career, relationship or personal problems.